Did New Idea Inadvertently Reveal This Year’s Bachelor Winner? [Warning: article contains spoiler alert] The leaks from this season’s The Bachelor keep on coming with weekly gossip magazine New Idea claiming it knows who the final five ladies are that ultimately vie to win Matty J’s heart. We’re not even a week into the series and, as yet, none of the 22 potential suitors are yet to be de-rosed and punted from the show. According to the story in New Idea, Elise, Tara, Laura, Lisa and Michelle are the ladies who’ll to be there at the business end of the series. The magazine also reported that Laura “was favourite” (pictured below), which reinforces rumours in the media that she is, in fact, the show’s ultimate winner. The latest news follows on from a string of spoiler alerts that include allegations a paparazzi photographer hid in bushes while the final was being filmed in Thailand and has been trying to sell images of the winner to media outlets. Ten have repeatedly denied the existence of any such photos. There has also been rumours that two of the girls – Jen Hawke and Leah Costa – are actually paid actors and are merely on the show to stir trouble and boost ratings. Although the show is pre-taped and contestants must sign strict confidentiality agreements, over the weekend both Matty J and Laura posted separate images of themselves to Instagram coincidentally both skiing. 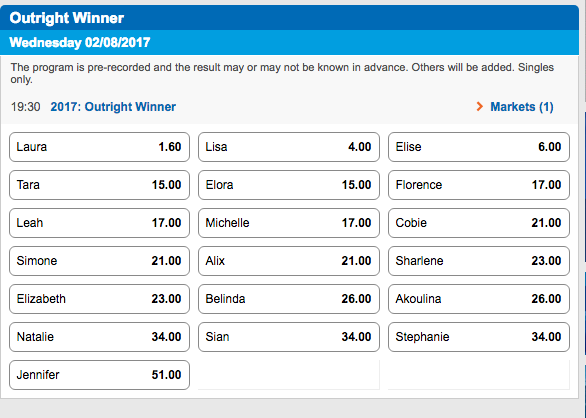 According to online betting agency Sportsbet, Laura is a clear favourite to win, too. She’s $1.60 to take the prize, followed by Lisa at $4, Elise at $6 and Tara and Elora next at $15. Jennifer is the worst priced of the ladies, she’s paying $51 for the win.